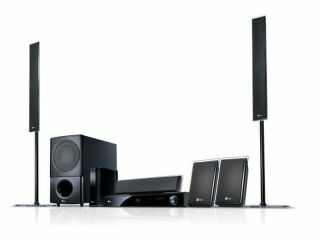 LG has unveiled its Blu-ray and home theatre player ranges for 2010 – with the flagship LG BD590 featuring a built-in 250GB hard-drive, GraceNote MusicID stream, NetCast and built-in WiFi. The LG BD590 combines a Blu-ray player with a powerful media hub, prividing on demand movies and IPTV functionality via the NetCast Entertainment Access platform, as well as a hard-disk to store your other media. As you may expect, BD Live is present as well as 1080p upcasling of DVDs and Bonus View features that privide pocture-in-picture access to Blu-ray Disc special features. "LG is committed to offering consumers easier access to more content-on-demand, which is reflected in our 2010 line of Blu-ray products with new content partners, advanced technology and unique design," said Peter Reiner, senior vice president, marketing, LG Electronics USA. "As the pioneer in providing content-on-demand options for consumers, LG builds on this reputation by offering full product lines designed to help consumers transform their home entertainment experience into something better." Heading up the home theatre systems range is the LG LHB975 – which offers three channel wireless technology for the subwoofer and two satellites and NetCast Entertainment Access. The system brings 1100 watts of output power to 5.1 channels featuring LG's silk dome speaker technology as well as Dolby True HD and DTS-HD Master Audio Essential and a drawer docking system for iPods/iPhone. "The LHB975 caters to most consumer listening needs by playing multiple media contents, from CD/DVDs to Blu-ray Discs to network streaming content, all accessible from a single home theater system," says LG's release. "The dual HDMI (version 1.3) inputs can also deliver great audio performance and convenient connectivity for devices such as cable boxes or game systems in a simple, easy-to-use format. This model is also DLNA-certified allowing consumers to easily access content on other compatible devices." Aside from the range-toppers LG also announced the the BD550 and BD570 Blu-ray players and LHB535 and LHB335 home theater systems, which all featuring NetCast Entertainment Access. The BD570 is much the same as its BD590 brother but without the hard disk, while the BD550 is a slightly cheaper option. LG's LHB535 has the same features as the LHB975 with the exception of the 3-channel wireless speaker technology and tall and slim front speaker designs with the LHB335 the cheaper, less featured option. We'll bring you UK release dates and prices when we get them.